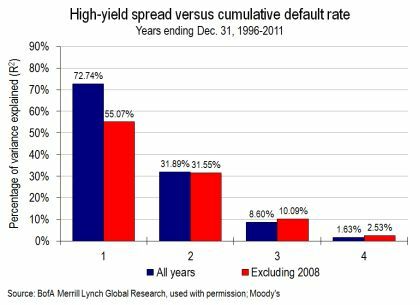 Fridson: How far out does high-yield bond market look in discounting default rates? Note: The following is a special monthly report from Marty Fridson. For his latest weekly column, please see “Industry Sharpe ratios,” published on July 30, 2013. The practical significance of this result is that the 3.50% expected default rate exceeds the current consensus default rate forecast. Moody’s, for example, currently projects a U.S. default rate of only 2.40% over the next 12 months. Strategists deduce that high-yield bonds are undervalued because according to their pricing, the market expects a default rate about one percentage point higher than econometric default-rate models predict. This is not a unique result. According the breakeven model, there were 25 months between 1997 and 2012 in which the market expected a negative default rate. Given that a negative default rate is impossible, the most widely used method for backing out the expected default rate and valuing the high-yield market fails the test of internal consistency. As discussed elsewhere, we believe the soundest method for deducing the market’s expected default rate utilizes the distress ratio, defined as the percentage of issues in the high-yield index characterized by an option-adjusted spread (OAS) of 1,000 bps or more, indicating a high probability of default (note 4). Furthermore, the best-supported method of determining the value of the high-yield market does not attempt to back out the market’s expected default rate and compare it to a default-rate forecast. Our own methodology instead employs a multiple regression model to explain the historical variance in OAS. This approach enables us to calculate, for a given month, a fair-value spread, given the level of total risk. (Total risk is not limited to default risk and does not incorporate a fixed – and therefore, at most times, inaccurate – illiquidity premium). Comparing our methodology’s fair-value spread to the actual spread determines whether high-yield bonds are rich, cheap, or fairly valued (note 5). Notwithstanding the inherent superiority of a method that does not indicate that the market frequently predicts a negative default rate, most strategists cling to the flawed breakeven model. Their fidelity to a discredited approach raises a problem that is of at least academic interest. Specifically, by comparing the market-implied default rate to a one-year default-rate forecast, the breakeven method implicitly assumes that the OAS reflects only defaults that are expected to occur within the next 12 months. Such an assumption is certainly open to question. At first blush, the high-yield market appears greatly undervalued, as its OAS indicates an expected default rate of 4%, double the consensus of 2% in Year 1. Is it not possible, though, that the market is being a bit more farsighted and taking into account that the default rate is predicted to triple to 6% in Year 2? What if the market is splitting the difference between the 2% Year 1 default rate and the 6% Year 2 default rate and discounting a 4% rate? In that case, the OAS of 547 bps is exactly in line with the default rate outlook. Rather than being grossly undervalued, high-yield bonds are fairly priced, according to this analysis. For steadfast proponents of the breakeven method, it matters a great deal whether the market sees beyond one year or ignores evidence that the default rate may be considerably higher or lower in the subsequent year. Indeed, it is conceivable that the market looks out to the third or fourth year or beyond. To answer the question, we make an essential assumption that on average, the market accurately estimates future default rates for as far out as it can. Based on that assumption, we reason that the period (number of years) over which the market looks ahead at default rates is the period over which the cumulative default rate best explains (has the highest correlation with) the beginning-of-period OAS. In the chart below, the vertical scale (y-axis) indicates the percentage of OAS variance explained (R-squared) by the subsequent default rate. The horizontal scale (x-axis) shows the number of years over which the subsequent, cumulative default rate is measured. For each year we show both the R-squared for all years in our observation period and the R-squared excluding results related to year-end 2008 (the inordinately large OAS on that date, 1,812 bps, may produce an exaggeratedly high correlation). If the R-squared for the two-year cumulative default rate were higher than the R-squared for the one-year default rate, it would imply that the market was looking out beyond one year and discounting default rates out to two years. We find, however, that the percentage of variance explained is substantially higher over a one-year horizon than over a two-year horizon (55.07% versus 31.89%, using the figures that exclude the 2008-related results, as detailed above). The R-squared trails off sharply in Years 3 and 4. We conclude that users of the breakeven method need not worry about their method, flawed as it is, being made worse as a consequence of the market discounting future defaults beyond one year. Our thinking about the main question of this report led us to run one additional test. We broke down the speculative-grade universe into its alphanumeric (Ba1, Ba2, etc.) components. Next, we calculated the monthly mean OAS for each alphanumeric category for the period 1988-2012. (Moody’s first applied its 1, 2, and 3 modifiers for the Caa category in 1998.) For each horizon from 1-10 years, we ran regressions to determine how much of the variance in OAS among the Master II’s equivalent alphanumeric categories (BB1, BB2, etc.) was explained by those categories’ cumulative default rates. In the chart below, the y-axis indicates the percentage of variance in OAS among the alphanumeric rating categories that is explained by cumulative default rates. The x-axis shows every horizon from 1-10 years. R-squared is very high (94.17% or above) in every horizon. There is a slight escalation from 99.16% in Year 1 to 99.98% in Year 2, followed by a monotonic decline through Year 10. These results suggest that the market looks out two years in differentiating the risk premiums on different gradations of speculative-grade debt. That is despite the fact that the previous chart indicates rather forcefully that the market does not look beyond one year in determining the risk premium on the high-yield category as a whole. As for applications of this ancillary finding, portfolio managers can use it to assist judgments that at a point in time the differentiation in OAS among the rating categories is too great or too small. Suppose, for example, that with the year-ahead forecast of the default rate at 3%, the market seems to be rewarding investors too generously for shifting from B issues to Caa issues. Further suppose that the portfolio manager believes the default rate will escalate to 5% in months 12-24. Our finding would lend support to the view that the market is looking out beyond the first 12 months and that therefore the pickup from B to Caa is fair, rather than generous. 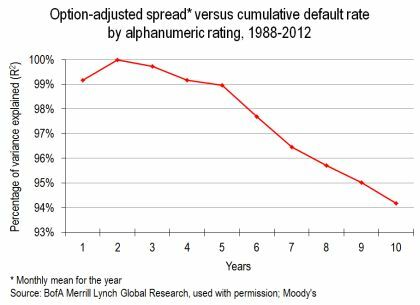 One useful finding of this study is the very high explanatory power of future default rates with respect to the high-yield OAS, as illustrated in the first chart. To be sure, that explanatory power is with the power of hindsight. If we had a crystal ball to tell us the default rate for the next 12 months, we would incorporate it into our fair-value model. As it is, we must rely on explanatory variables that are known at the time of the valuation. The contemporary (trailing) default rate is known, but at least as far as OAS goes, has little explanatory power. By far the most powerful variable in our fair-value model is a measure of credit availability derived from the Federal Reserve’s quarterly survey of senior loan officers. 1. Treating U.S. Treasury obligations as default-risk-free instruments was an analytical convention, rather than a literal reflection of reality, even before Standard & Poor’s downgraded the debt from AAA on Aug. 5, 2011. The AAA rating does not indicate total absence of default risk over an extended period, even though no corporate issuer has defaulted within one year of holding that rating. 2. This figure does not represent the yield on Treasuries of one particular maturity. The option-adjusted spread on the high-yield index is derived by spreading each of the index’s constituent issues against its corresponding point on the Treasury yield curve. We calculate the underlying Treasury yield by subtracting the index’s option-adjusted spread from its yield-to-worst. The resulting figure tends to correspond roughly to the five-year Treasury yield. 3. We calculate this historical figure as the yield-to-maturity difference between the BofA Merrill Lynch High Yield 100 Index and the five-year Treasury Index. The superior definition, referred to in note 2, the mean OAS on the High Yield Master II Index, is available only from Dec. 31, 1996 onward. From that date through the end of 2012, the rough-and-ready calculation based on the High Yield 100 exceeds the OAS calculation by 34 bps. 4. See “How to tell when distressed bonds are attractive” (Nov. 28, 2012). 5. See “Determining fair value for the high-yield market” (Nov. 13, 2012).